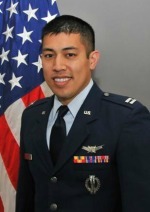 Captain Gregory F. Tengco is a Missile Warning Crew Commander assigned to the 12th Space Warning Squadron as a Flight Commander, Thule Air Base, Greenland. He was born in Albuquerque, New Mexico, and attended the University of New Mexico where he received his Bachelors degree and was commissioned as an officer in the United States Air Force. He was assigned to Malmstrom AFB in 2007 as an Intercontinental Ballistic Missile Officer. At Malmstrom AFB, Captain Tengco was awarded Squadron Company Grade Officer of the Year, Group Company Grade Officer of the Quarter, and Wing Company Grade Officer of the Quarter. In 2011 he was assigned to the 12th Space Warning Squadron at Thule AB, Greenland where he has served as a Missile Warning Crew Commander and currently serves as the Operations Support Flight Commander. His military awards include the Combat Mission Readiness Medal and the National Defense Service Medal. Captain Tengco attends classes at Colorado State University in Colorado Springs, Colorado, and is working toward a Master’s Degree in Business.